Jim certainly knew Elaine May’s work long before he met with her to discuss the Labyrinth script in late February and in the second week of April, 1985. Lauded as a writer and director, May first made her name in the late ‘50s as part of a comedy duo with Mike Nichols. Jim had a 45 rpm record in his collection of excerpts from the Nichols and May 1959 album “Improvisations to Music,” and he worked the same variety show circuit that Nichols and May toured. By the early 1980s, May had written or contributed to the highly respected scripts for Heaven Can Wait, Reds and Tootsie. 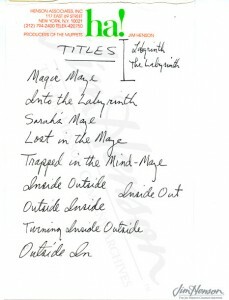 Given how much care Jim was putting into the crafting of his Labyrinth script, it is not surprising that May was brought in to polish it before shooting began April 15th. 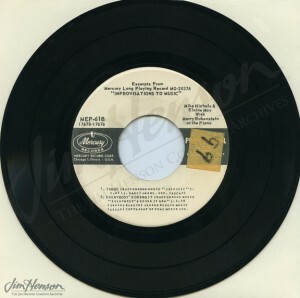 The final script, credited to Laura Phillips and Terry Jones, incorporated May’s comments and was dated April 11, 1985. Read more about the development of the Labyrinth script here and here. 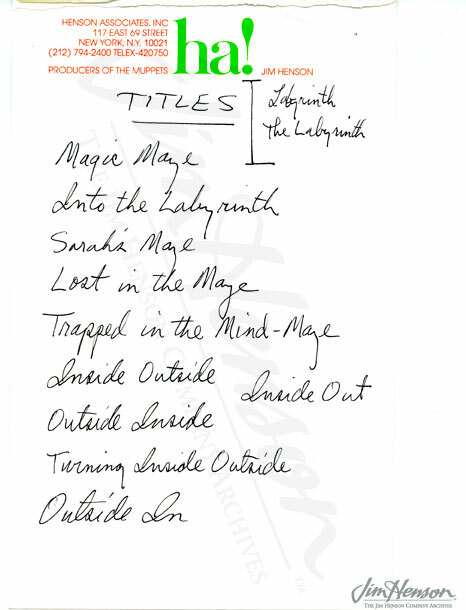 Jim’s title ideas for Labyrinth, 1984. This entry was posted in 04-April '85, 1985, Labyrinth and tagged Elaine May, Laura Phillips, Mike Nichols, Terry Jones. Bookmark the permalink.